There is a paradox at the heart of the LEGO building experience. Certain combinations of pieces imply established uses or conventions. However, as soon as the LEGO builder recognises these rules they seek to use these pieces in ways that push the convention as far as possible. Yet, no matter how extreme the deviation, the convention is preserved. This is the joke at the heart of the LEGO hobby. 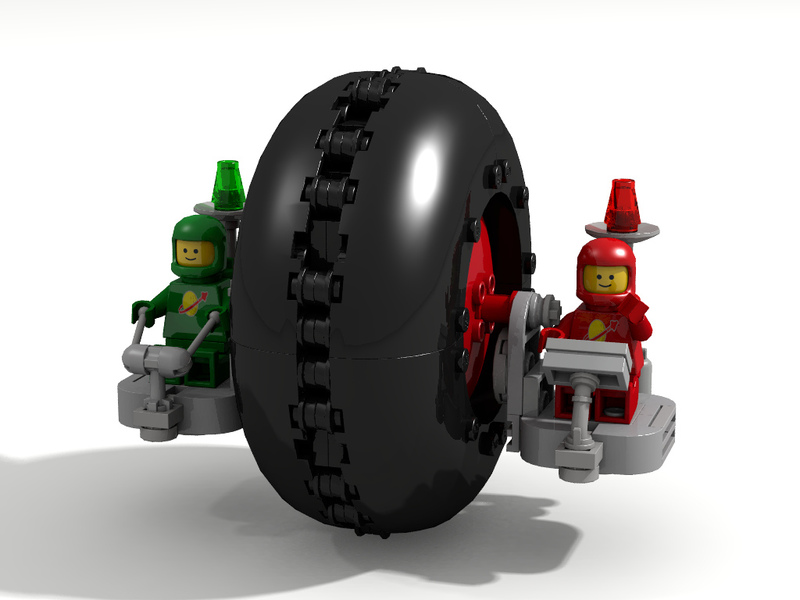 Like the joke about the Moon, that gives an impossible answer, that it orbits the Earth to get to the other side – there are no sides to an orbit only perpetual movement – the LEGO hobby offers choices within conventions, which allow us to build together, to be different through our sharing of creative projects. And of course I chose the joke about the moon, because instinctively it reminded me of this logo; the Classic Space symbol. But in this case the shuttle slingshots out of orbit! All art forms have conventions, cultural forms that define them. The realist novel, pop art, atonal music and many others can be taxonomically defined based on stylistic conventions. What is different for LEGO is that it originates from a design driven, or manufactured form. Pieces, even generic pieces that suggest multiple standard building uses, begin from a designed application. No matter how many new functions a specific piece can be turned to, it is the fact that it is turned to a new use that LEGO cannot escape. And the original utility of the piece remains as a possibility no matter how far it is taken away from its designed origin. The croissant that can become a crab’s smile, can still find its place in the LEGO Friends Downtown Bakery. 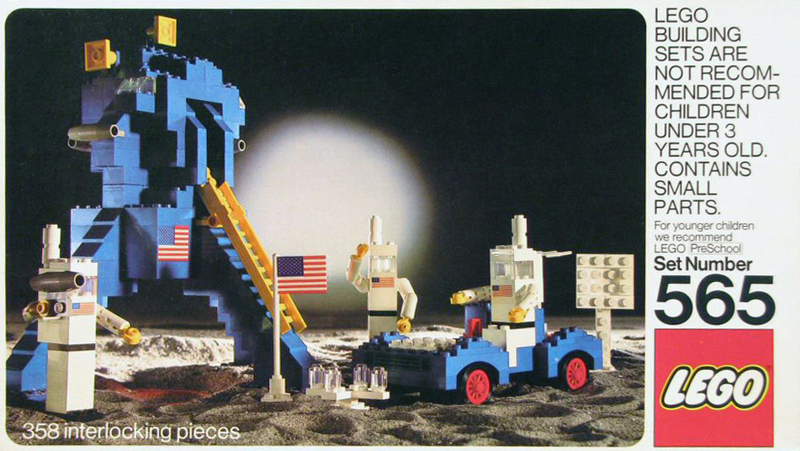 Many of the principles that pieces in the LEGO catalogue were put to, are doubly designed. In that not only are they created to achieve a given use within a set or theme, they are also imitations of real examples of industrial design. Most obviously you see this in door, window or wheel pieces. 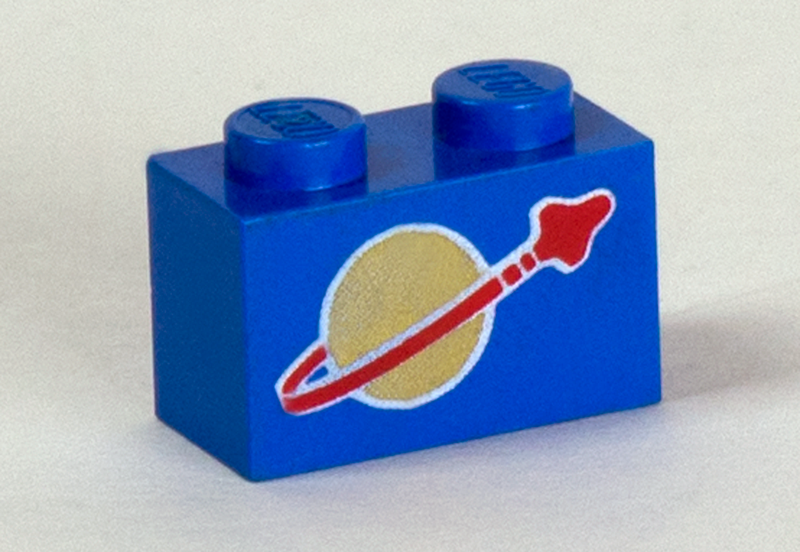 Things become explicit when LEGO starts to duplicate the shapes and forms of the space industry. 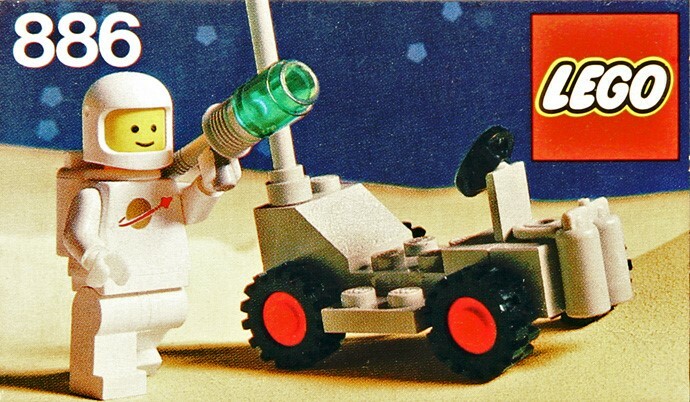 Take set 565 Moon Landing, arguably LEGO’s first foray into the space theme. Its forms, pieces and structures all echo the technology of the space race era. As the theme of space and science fiction grew in popularity during the 70s so did the design of pieces based on real space exploration. 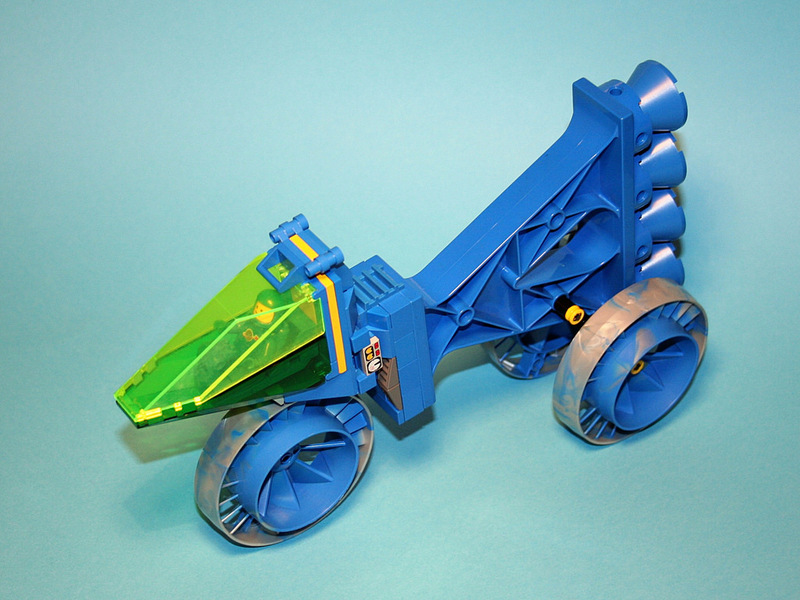 Possibly one of the most talented and important fan builders, the late and sadly missed Nnenn (Nate Nielson), achieved great things for the building community when he explicitly linked the design potential in LEGO with an understanding of its conventions; that conventions are uniquely placed to inspire invention. However, what I think Nnenn’s most important contribution to the community was, as Goldman hints at, is the idea that a collective of builders can engage in a shared design process. By sharing conventions, and exploring them together, rather than this endeavor limiting creativity and inventiveness, it provides a framework for expanding it. I’m not sure whether this is true, but video game folklore suggested that the Vic Viper’s shape was determined by the need for the limited graphical capacities of 80s computers to create a roll animation. The twin front prongs giving a distinctive shape when seen from above or below, which sharply contrasted with the sleek side-on view. What Nnenn succeeded in doing was transplanting the design methodologies found in other disciplines, such as video game design, and present it to the LEGO community in a way that was fun, informative and transformative in the way people approached what they built. I think the teacher in Nnenn was offering a way of helping builders better their craft (in both senses of the word). We all learn when we apply our creativity to problems and limits. Nnenn’s legacy lives on in the yearly tribute to his influence. The month long gala of Vic Viper building, now known in reverence to the master of the art, as Nnovvember. This way of thinking, although new to the LEGO building community, is of course integral to all design-based creativity, but it is also present in non-problem focused creation. Take for example the literary movement, OULIPO [v](Ouvroir de littérature potentiell), which translated into English means something like, Workshop of Potential Literature. This group of writers that included the likes or Raymond Queneau, Georges Perec, Italo Calvino and Harry Matthews, began from a principle that by establishing writing conventions, experimentation, potential and importantly fun could be fostered. Techniques included the use of lipograms (writing that excluded a given letter) or snowball poems (verses in which each line is one word longer than the last). The results were dynamic and new ways of writing and making literature. LEGO as a medium, as previously noted, brings with it the type of convention challenges that the OULIPO writers had to impose. LEGO pieces intrinsically enforce designed limits, which require our imagination to expand. The LEGO community soon pushed against these design limits, through experiments like those set by Nnenn, and stumbled into the strange world of invention explored by the OULIPO writers. Being a LEGO builder always means building with constraints, by continually imagining something beyond the constraint! 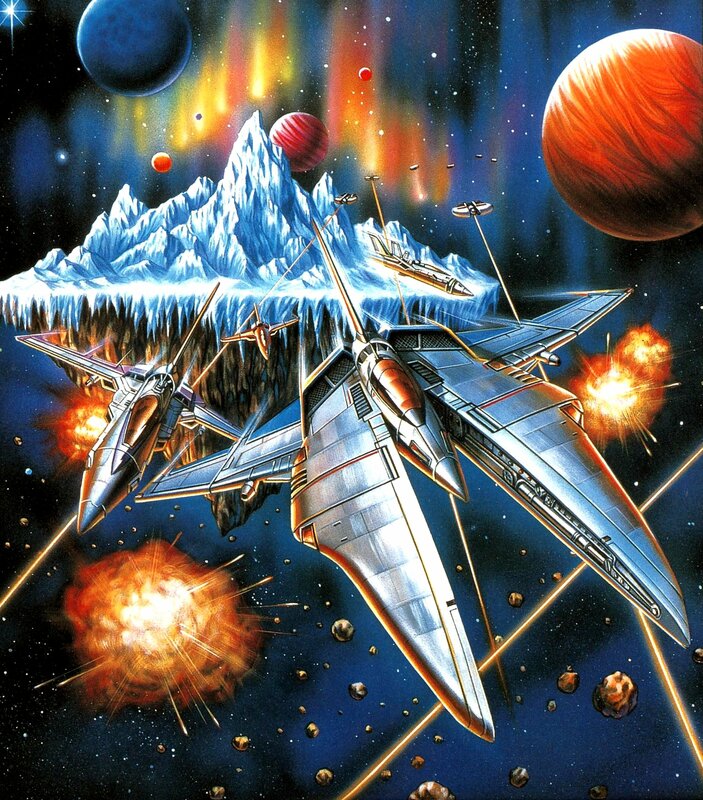 Where a design precedent was set, for example animation needs for the Vic Viper spaceship, once taken-up as a generative convention for the LEGO builder, the original design aim of the Gradius graphic designers becomes something else. The Vic Viper is no longer a shape suited to 8-bit graphic technologies, but a pure call to explore how far a design principle can be taken. And the Vic Viper was mutated into ever stranger and more unexpected shapes. Of course following Nnenn’s case study, many other conventions were taken up by the building community: the 100-stud long spaceship festival that is SHIPtember[vi] (The S.H.I.P, standing as an acronym for seriously huge investment in parts), or the currently running FebRovery[vii], a celebration of every type of lunar rover imaginable. FebRovery is an especially good example of where conventions and shared invention are at present taking the LEGO community. Set-up in 2011 by the irrepressibly inventive and hyper-productive space builder Crimso Geiger[viii], the event can be singled out from other convention building events on two grounds. It is not a contest, to see who can build the best variant of the rover convention; the project’s aim is simple, to explore the fun and joy of experimentation. Added to this, is the fact that the conventions for rover building presented by the event are more instinctive than fixed. No doubt this further expands the level of innovation possible. Taking a look at just a handful of creations made this year, one is struck by the variety and charm of the project. What FebRovery should be celebrated for, is that not only does it explore the creative potential of conventions, but through communal invention alters these conventions. 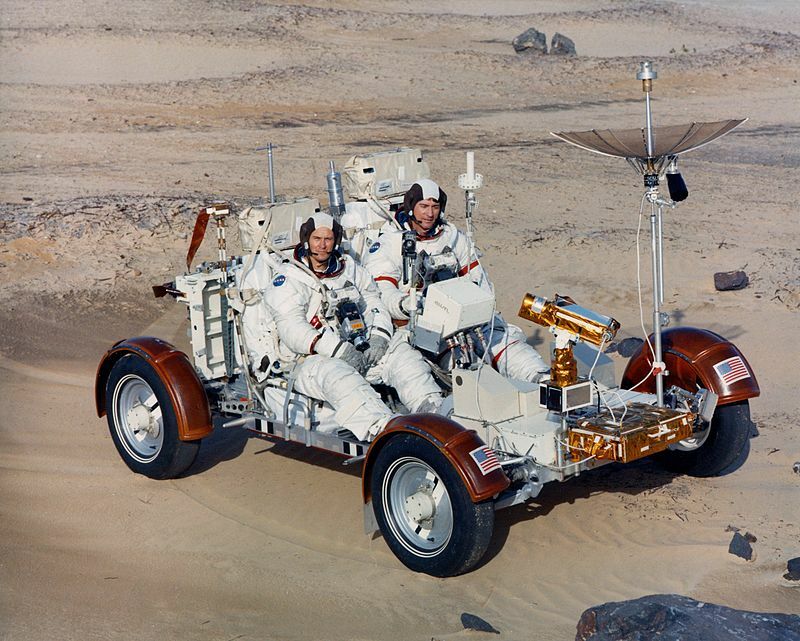 After 4 years of FebRovery, the community’s understanding of what constitutes a lunar rover has changed. It is stranger, more colourful, less tied to the NASA launches of the 60s, or even the nascent thrill of the Star Wars films, than it was in 2011. 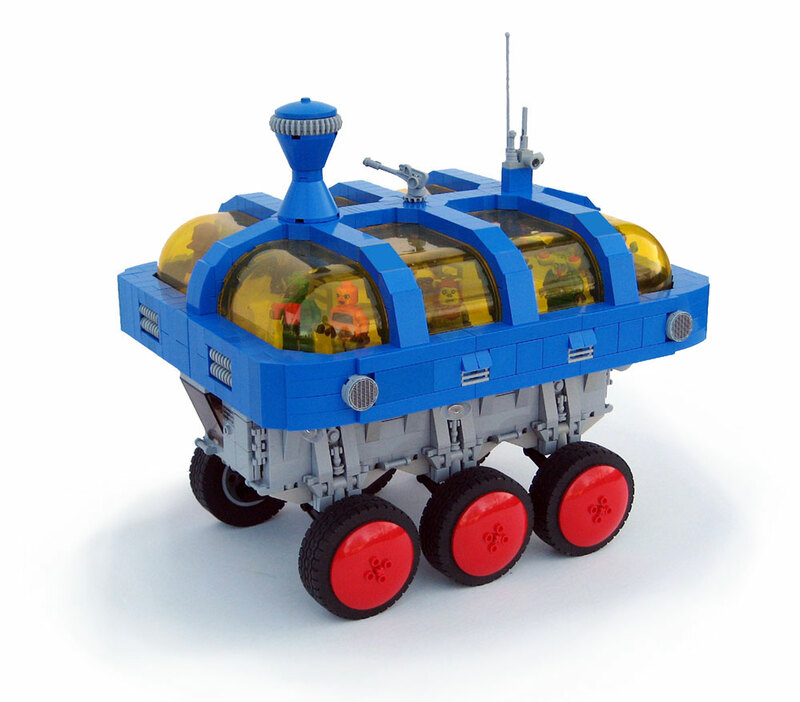 LEGO rovers have become a genre in their own right. Capable of displaying humour, surreal forms, pastiche and irreverence. When we talk about LEGO as an art form, it is easy to call on individual builders, or particularly interesting creations. 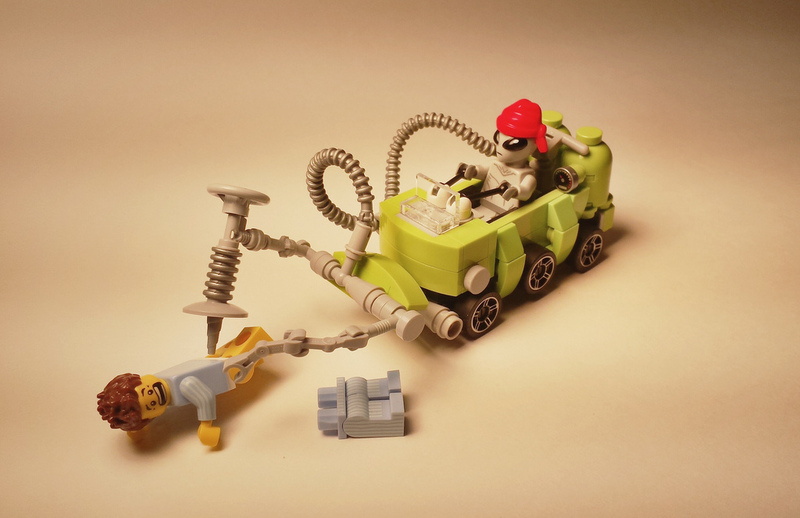 However, we sometimes forget that the best examples of LEGO as art, is found in the shared archive. The way builders, when they share in a project, expand understanding and creative potential. Artists like, Olafur Eliasson in his The cubic structural evolution project (2004)[ix], who I discussed in my first blog article[x], have explored this shared creative potential found in LEGO. And whilst interesting, I would argue, the broader and more exciting projects are found in the self-establishing, shared ventures, such as FebRovery and Nnovvember. In these catalogues of communal shared expression we see the living and breathing power of LEGO builders. Few other creative practices so successfully join creative minds together in inventive processes as LEGO does. Perhaps it is only a matter of time before a curator steps forward and takes a group archive such as the FebRovery portfolio and places it in the gallery context. And all that is left to say is that we LEGO builders do it best, when we do it together. Posted on February 21, 2015 January 8, 2017 by David Alexander Smith	This entry was posted in Uncategorized. Bookmark the permalink. Again David blows my mind – I was unaware of FebRovary until now – not being a big MOC builder. But I am inspired but also a little confused! Fundamentally – are the bricks defining our play or the other way around? Because bricks present us with shared limits, they help us find ways where together we imaginatively overcome these conventions. FebRovery is one fun example of how this happens. Hence the brick inspired us but we still stay within the limitations of the brick (as it was designed). Overcoming those limits would be to take the brick into unimagined places (ie that which the designers had not thought or projected). Which leads us to brick-hacking (i don’t know if this is the right term) but where bricks are physically altered to produce unthought of design? I really like this article David, got me thinking quite a lot. I hope my thoughts are on the right track. Thanks a lot and keep up the great work. Lego bricks are designed to fit, even in the most simple 2×2 blocks, one on top of another. They were designed to do this. The first time someone put the bricks sideways or upside down, this first designed convention was broken. The breaking of the convention could only occur, because there was such a strict convention in the first place. The more designed the thing is, the higher the chance is for us breaking the rules. I introduced this argument through a paradox for a reason. Glad it has got you thinking, and yes you are on the right tracks. I think there is an implicit desire/necessity in the creative personality that thrives on pushing any limits set on them. It is a defense mechanism/bit of pure hubris to see the limitations and NEED to go beyond. These aren’t good or bad but rather essential for a healthy dialog between the art created and the creator creating it. Once the gauntlet is thrown, as an artist the only response possible is, “Game on!” It is an inescapable lure and an appetite that must be sated. Competition and collaboration feeds us builders quite the delicious meals. And the addition of the limitations of Lego are negated as the conversation in our heads begins and we look at every piece sideways. The “box” of Lego affords us all a better view from above. Yet again, you provide us with a fantastic article that fully expresses the collective belief of this magnificent community. Bravo! It is the community which really makes the Lego builder special. I can say from personal experience that the way I’ve viewed and interacted with other builders online has pushed my creative projects into unexpected territory. There’s an irony here, that perhaps by being resolutely plastic, contingent and real, Lego might just be the ideal digital art form. A very enjoyable read. I liked the story contained within this article: it felt as much a history of the development of Lego space building as an examination of the ideas. A bit of accidental curating on your part? And so to OULIO and Lego, as I mentioned on MOCpages. As somebody who builds using both real bricks and the Lego Digital Designer CAD system (LDD), your article has thrown into light some of the ironies of each system when it comes to freedoms and limitations. LDD is an infinite box of bricks, limited only by the size of the processor and memory in your computer. For this reason it is often banned from competitions (though a builder with a bigger wallet can just buy more real bricks and therefore has more building potential than a builder with no funds). LDD allows you to create almost any Lego part in any Lego colour: you can create virtual bricks which do not exist in the real world. 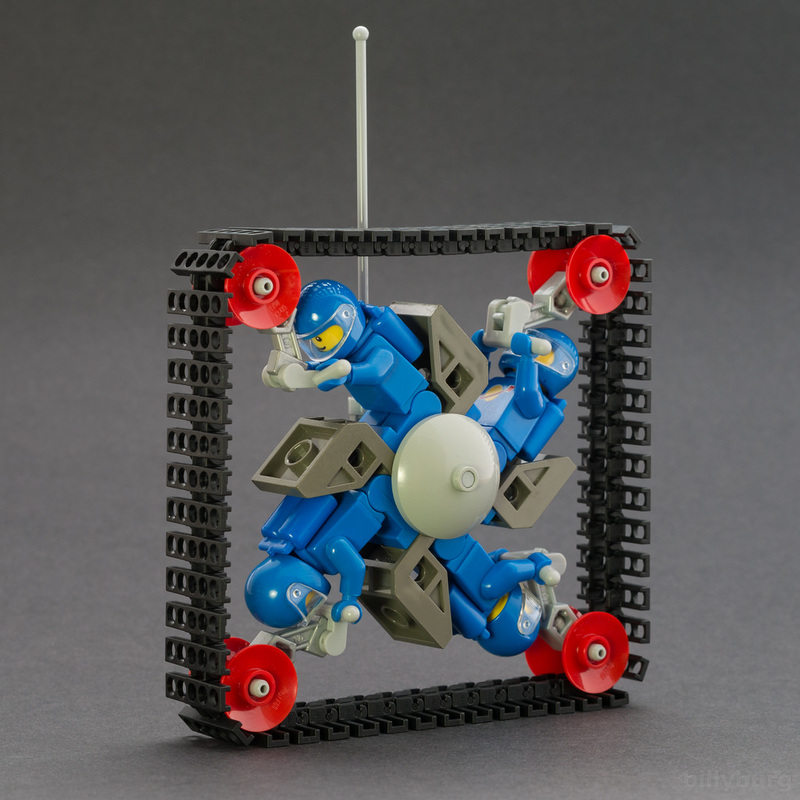 However, by choosing to build in LDD, the builder (or artist if you want to think that way) chooses to impose on themselves a strict set of rules governing how the Lego elements can be joined together. Skilful, creative builders like Billyburg, who you mention in your article, could not create a lot of their beautiful models in LDD. You can’t cut up and bend virtual Lego tubing. Minifigures’ hands have to stay firmly attached to their arms! I love how neatly balanced this irony, this choice, is for the Lego creator. An infinite box of virtual LDD bricks but conformity a strict set of “legal” connections or total freedom to use real-life pieces exactly how you like (and to include non-Lego elements and paint and cutting too!) but limited to what you have to hand (unless you’re very rich and prepared to wait for Bricklink deliveries or sales on amazon). As both you and Matt have said here, a lot of the fun comes from making your choice and then working out how to exploit, subvert and exceed the limitations of the system. I think the LDD versus real bricks debate is ripe for investigation. It is one of those discussions that immediately brings certain simplistic arguments out into the open. Sides are taken, and authenticity claims asserted for each type of building. You do a good job of pointing out how, with even the slightest logical analysis, these arguments crumble. What is far more interesting in this debate, and where I’d like to pick things up, is the fact as you eloquently put it, that certain specific conventions apply to LDD building. But how do these manifest in styles of building? How much more interesting and positive a discussion it would be if we were able to show the unique creative forms that only LDD provides. Again, some counterpointing with say Minecraft could be helpful, and extend the thinking I was doing in the Lego Lilliput post. Yes the 15-piece challenge has produced some amazing creations this year. I’m waiting for someone to set-up the 1 piece challenge, which will involve people photoshopping individual bricks into real life. I have to admit that I love FebRovery and you managed to pick out a couple of my favourites. I have taken part in a couple of building months – HARDnuary is a favourite of mine and showcases Kosmas Santosa amongst other fab builders. Much more fun to share and comment with some collective building challenges. Great blog post, and I concur fully with your conclusions. HARDnuary is another great contest. The idea of impossible builds, always makes us want to build all the more. I genuinely meant it too when I said that a collective presentation of builds in a gallery could be a fantastic thing. Yes collective inspiration often seems to spawn the best work. There’s a good coffee table book idea from Hradnuary, Febrovery through to FOODcember! And interestingly all these building month titles read like an OULIPO poem! Yeah, another blogpost that I really enjoeyed reading! I especially like the last sentence. My favourite examples of the last years are the “15 Pieces Vehicle Challenge” and your “Classic Space Pocket Money Contest”. Both of them have a very simple set of rules and the results are always a big surprise. The limited resources make it even more fun to create something special, and to see what other builders have done with the same amount of bricks is so inspiriting. The CSPM will of course be back. There might even be an exciting stop-gap – sorry to be such a tease.